Drill press once used to be all about a rotating spindle that allowed you to drill through objects, that is all you needed to about drill press. But, as the time went by and technological advancement took place, the definition of a good drill press changed. Now there are so many new mechanisms provided with the drill press that it has almost become impossible to keep up with them. But, being a DIY-star at heart, I have come to know so much more about these machines. Drill presses are one of the most used tools when you want to build something from scratch. So, I thought I should share my knowledge and opinion with you guys so that you can be well informed about drill press and make better use out of it. Currently, there are 40 different kinds of drilling machine out there in the market with more being added now and then. It is hard to keep track of all of them, but I am just going to discuss the most common ones with the most famous brands. I will also give you a sneak peek at the types of accessories that come with the drilling press, along with some additional parts. But most importantly, I will guide you through different drilling functionality and how to maximize the performance. Oh yes, as a bonus I will also tell you how to identify the best kinds of drill presses and what are the must-have features of such machines. Are you ready? Before you can understand the whole mechanism of a drill press, you must learn about the basic parts associated with the product. The shape or size of each part may differ from one brand to another, but they all perform the same task. The Head:The head is where all the wired parts and the control panel is usually situated. You can see how and regulate how your machine would function with the help of the head. The Spindle:This is the part which does the main drilling. You can switch between different types of spindles depending on your needs. There can be a whole separate article about drill press spindles. The Spindle Chuck: This is where you put your spindle and adjust it according to your needs. The chuck can be both removal and non-removable, but it usually catches and releases the spindle with easy function technology. The Motor:This is where the main power comes from. The motor can be situated in both the head or near the chuck depending on the brand. There are different motor types each allowing different forces of power. The Table: The table usually comes with an adjustable function. You can lower or rotate the table according to your needs. There are different types of holes preserved in the table, and sometimes, even some locks are provided by the manufacturers. The Base:The base is usually made with a solid element that keeps the whole thing together. It keeps the press sturdy and right in one place. The Column: The column is the base for aligning the spindle, the head, the motor and the spindle chuck. It can be lowered down, and it is usually manually operated. Floor Mounted Drill Press: These drill presses are the most classical ones and the first model of drill presses. It is usually mounted on a floor, and it allows the user to drill their object without using any table. These are usually very strong and has a motor speed of ¾ horsepower or more. Bench Top Drill Press:These are the modernized version of the floor mounted drill presses. They come with a controllable table which can be rotated and lowered according to the need. The drill press is then pushed towards the object, completing the whole process. Multi-Spindle Drill Press: You can guess nature of this drill press by the name. It features more than one spindle. These spindles can both run at once or even at a different speed according to the setting preferred by the users. Pro-Sensitive Drill Press:Finally, these are the most advanced versions of drill presses. These usually have less power but more controllability and functionality. They offer a variety of speed and precision, allowing the users to work in more sensitive objects. Laser Target:If you are a beginner at using a drill press then this can be your best friend. One of the problems that beginners face while drilling is keeping steady on the target. But, this laser will help you to get rid of this trouble. Precision Object Holder: Sometimes, a table is not enough to hold the object in place or maneuver the object properly. That’s why you can use a controllable object holder. You can flip the object, rotate it or even bend it by using an object holder. Circle Cutter:The circle cutter can also be your best friend while working with a larger target. It quickly allows you to cut a circle I aplastic, wood and nylon so you will be 100 times faster in your operation. Foot Pads: This is one of the most used accessories regarding drill presses. The foot pads can help control the power of the drill press allowing you to use both of your hands-frees. This certainly lifts up the productivity and the solid timing. The surprising thing about drill press is that there are different ways of using the drilling the materials. Each may come up with his way of drilling, but these are considered the most used methods of using a drill press. Pilot Holes: These are the light strokes applied to the materials. It secures the good being of the product as well as the precision of the target. Many professionals agree that you must start off with a pilot drill to be more precise in your drilling actions. Piercing Holes: These are the full drilled action applied to an object. The spindle travels through the material making a see-through hole into the object and releasing the grip of the object. You need larger spindles to make piercing holes into thicker objects. Depth Stop: Some drill machine comes with depth stops options so you can dictate how much or how deep you want to drill. You can set the limit at the start of the drilling process, and the spindle will stop accordingly. Round Stock Drilling: Finally, round stock drilling is the method of drilling a lot of rough materials in the quickest possible time. The motor is used to its full potential, and the drilling takes place in a straight line. This is the most productive type of drilling when working with a non-sensitive item. Now that you have a complete idea about drill press let’s look at some of the major players in the market. They have been in the market for a long period and have been producing durable, strong and versatile drill presses. These are the top four brands according to my opinion. Dremel:Dremel has been known for its innovative designs and easy usability. You will also find the signature easy control function is all of the drill presses of Dremel. One of its most sold out models is the Dremel 220-01 Rotary Tool Workstation Drill Press which makes drilling fun and simple. WEN: Another key player in the market, WEN has been producing good woodworking tools for the last few decades, and their stocks have been getting higher due to their increasing popularity. WEN is good at making compact drill presses with surprisingly strong power. 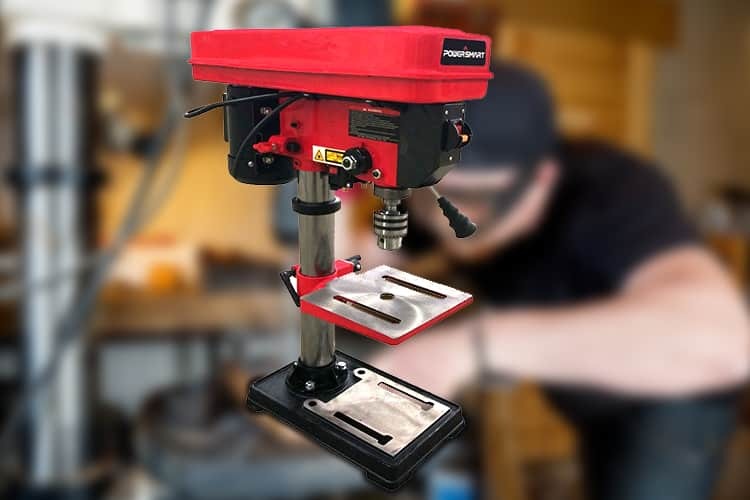 Shop Fox:Holding a perfect rating on Amazon.com, the Shop Fox W1668 Bench-Top Drill Press alone is strong enough to put this brand on the table. This model is easily the best budget drill press with tons of functionality for the beginners as well. Skil:Last but not the least, we have Skil which is arguably the most appreciated drill press brand in the market by the users. All of their focus is not about drill press alone, but also on the customer services as well. That is why they are so appreciated by the users. I think that now you have enough information about drill press to make a good decision. You should buy the press by analyzing your need and your budget by giving good importance to the quality of the machine as well. Oh yes, I know you have probably heard it for a million times, but, be sure to keep your safety gears on, okay? It is not wise to avoid safety measure while working on an electric device. Until then, have a nice day! 3 How to Make a Drill Press Table Perfectly at Your Workshop? 7 How to Use Biscuit Joiner to Join Your Workpieces Properly? 9 How to Use an Angle Grinder to Cut Metal Perfectly and Precisely?